Employers buy workers compensation insurance for 2 reasons – First it is State Law. Second, they want to avoid the financial exposure for catastrophic injuries. Workers Compensation coverage is view as an insurance policy when in fact it is administered like a line of credit. In almost all instances companies, not insurance carriers pay for the cost of injuries. Most businesses do not understand the cost sharing aspect of workplace injuries. What is the impact of no implementing effective injury management programs? Are injuries the inevitable cost of doing business? 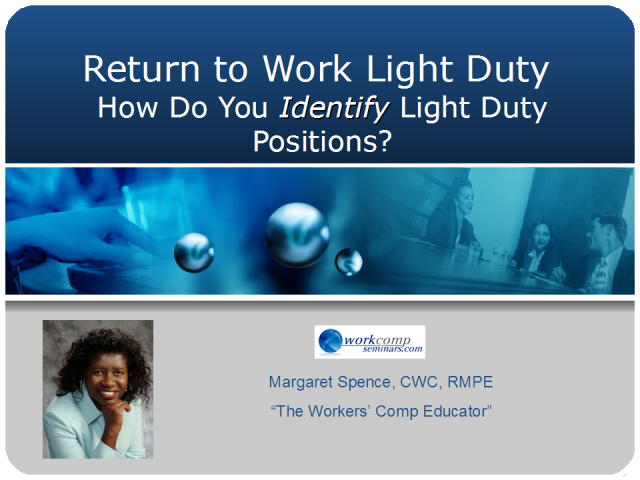 Title: Workers Compensation: How Do You Identify Light Duty Positions?